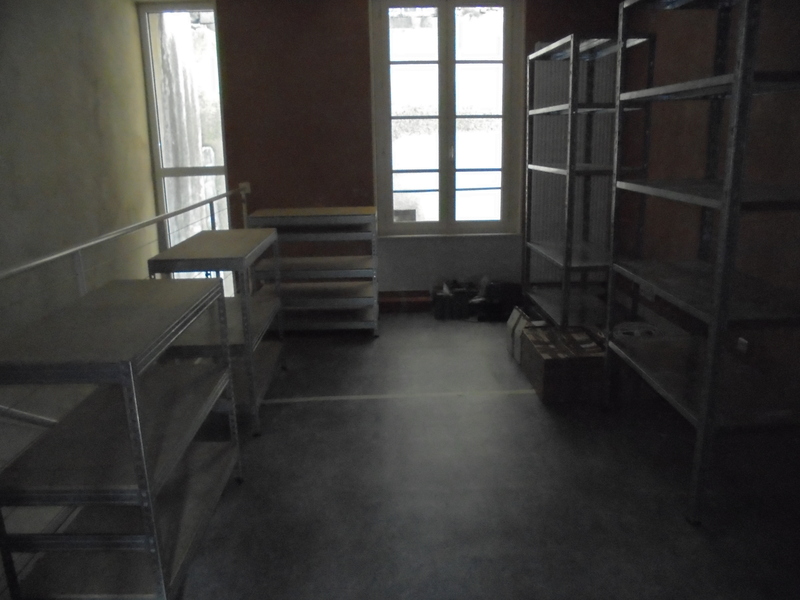 Usually, every time I relocate, one of the first tasks, after unpacking the cutlery and other kitchen accessories, is to start building a new machineroom - i.e. plan shelves location and how they will be filled, and build them again. This year, I was taken aback for a bit because one of the kitchen cupboards had not survived that last trip, and I ended with too many things scattered accross the kitchen and not enough furniture and cupboards to store it. While benign (a new and nicer cupboard has been ordered, and should be delivered in a few days), this caused enough disruption to my plans and my train of thought to make me consider doing things slightly differently. Plus, it would take weeks until I would have internet access at home (ah, the joys of the french ISPs handling relocation in the worst possible way, every time...), so it did not matter how much time it would take me to set up the computing resources. 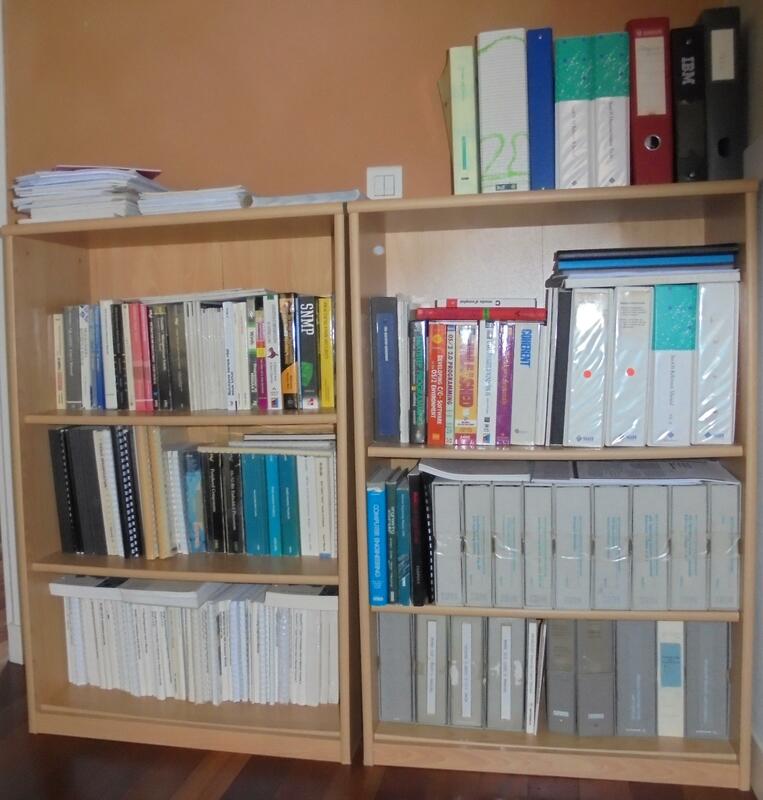 I therefore started by putting back the technical library. 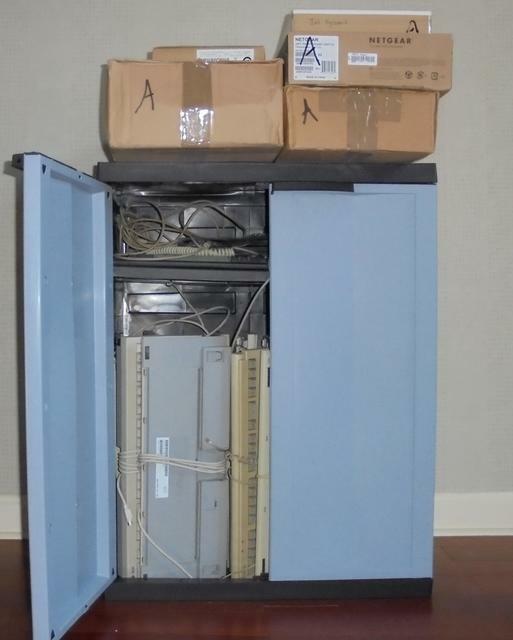 It mostly consists of dead-tree documentation for VME boards and a few SCSI and Ethernet controllers of the 1985-1995 era. But there are also a few technical books about languages and operating systems, an old Digital systems and options reference book the size of a phonebook, various processor or companion chips manuals, and two important books, witnesses of golden times: Tracy Kidder's ``Soul of a New Machine'', and Peter H. Salus' ``Quarter Century of Unix'', which every hacker should read, preferably multiple times. One important part of the machine room is the spare parts storage. 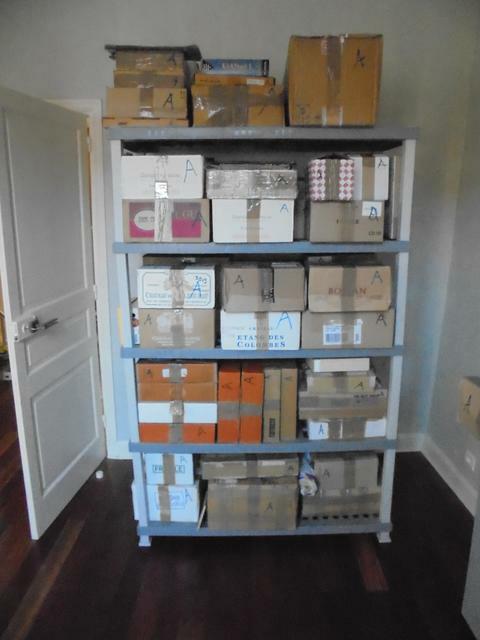 While, due to the relocation, the spare parts are conveniently already tightly packed in many boxes (most of them being former wine boxes - compact and easy to move, even the orange ones), there is still some work needed to put them back in the spare shelves, with the only important rule being: put the heaviest boxes as close to the ground as possible. ...especially because, from now on, I will try to store the spare keyboards in a dedicated cupboard. Of course, I ended up being too optimistic and could not fit all my keyboards in the cupboard, and had to keep a few keyboard boxes above it (I know the model M IBM keyboards are large, but I honestly thought they could fit... before realizing I had still shitloads of Apollo, Sun type 3/4/5, Digital LK-201/401 keyboards to put in there as well.) Which is why the picture only shows one door open... opening the other door would cause several Digital keyboards to hit the floor! Natural lighting was already too dim when I took that picture, but empty shelves do not really deserve anything better. I am still not keen building too many full-height shelves as I did in Toulouse ten years ago, but, unlike in Orgerus (my previous location), I am building two full-height shelves (the strongest structures, really). The other shelves will stop at belt height (well, for me... I am about 1m90 tall - that's 6"3' for you metric system-impaired readers), and I will nevertheless put a large weight of machines on top of them. I also intend to put four of the five large alpha crates in a square in the middle, while keeping some room for the VAXstation 3520 acting as a monitor tray to roll in there as well. Finally, not pictured, there is room to the right of the tall shelves; I intend to put a few of the largest crates in there (my last IBM RT/PC, one of the Data General AViiON, and the fifth large alpha, to begin with).